FREE One Week AIP Meal Plan - Heal Autoimmune Disease Naturally! 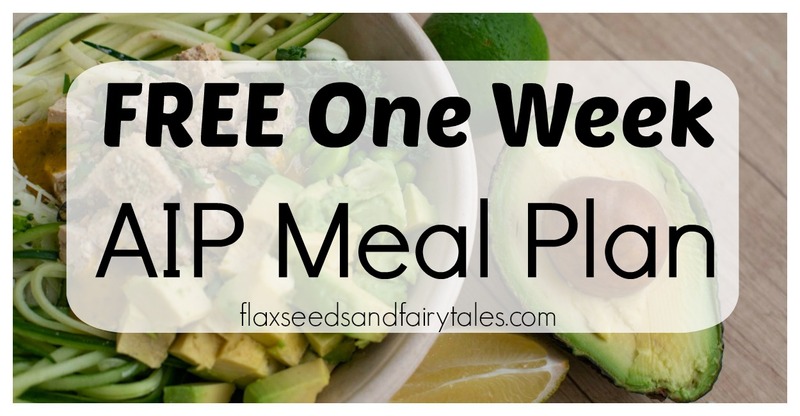 Welcome to this FREE one week AIP meal plan! I’m so happy you’re here! If you’re looking to heal autoimmune disease naturally, the AIP diet is a great place to start! The AIP diet can be super tricky. There’s a huge list of foods you can’t eat AND a variety of foods you should be eating every day or week in order to heal. This easy AIP menu for a week will give you everything you need to get started with no hassle. Your whole week is planned out for you following Dr. Sarah Ballantyne’s approach to AIP. I’ve designed this AIP meal plan specifically so it includes the optimal amount of vegetables, bone broth, fish and seafood, organ meat, and more to help you heal as quickly as possible. In just one week, you can feel more energtic, vibrant, and healthy! Important note: Please be aware that I am not a doctor or nutritionist. I am not qualified to diagnose, treat, prevent, or cure any disease or condition. You should always consult a qualified health professional before starting a new diet. See full disclaimer here. What can I eat on the AIP diet? 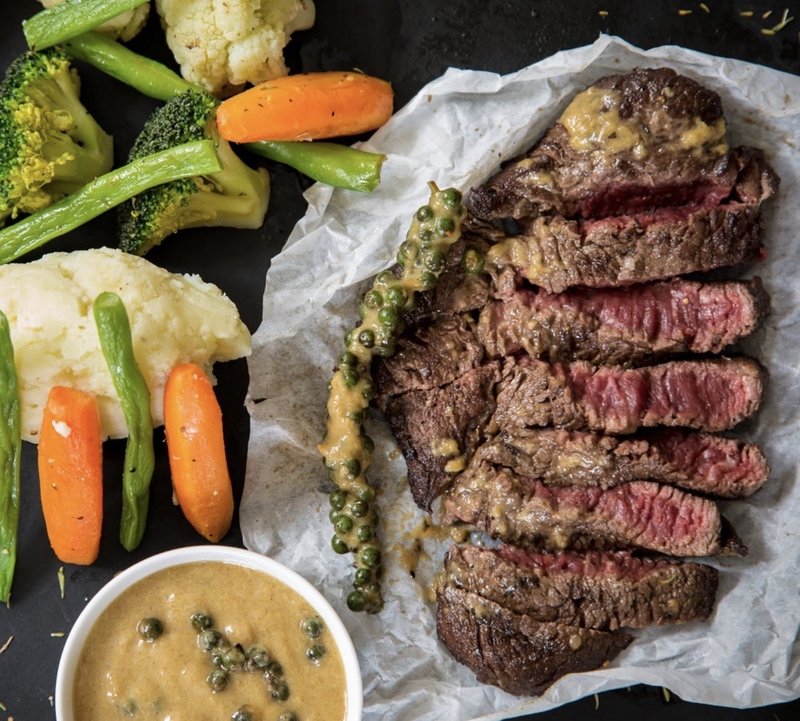 This menu plan follows Dr. Sarah Ballantyne’s approach to the Paleo Autoimmune Protocol (AIP) for healing autoimmune disease. You can check out her free AIP start guide here. If you’re brand new to the AIP diet, I highly recommend you read through the guide thoroughly. It will teach you exactly what you should and shouldn’t eat on AIP. 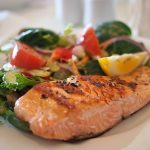 How does this AIP meal plan work? I’ve designed this AIP menu plan based on Sarah Ballantyne’s recommendations. Throughout the week, you’ll be eating a variety of nutritionally dense and healing foods. I’ve included an average of 8-12 cups of vegetables each day, 4 servings of fish and shellfish during the week (Dr. Sarah recommends at least 3), and 5 servings of organ meat and offal during the week (Dr. Sarah recommends at least 5). I’ve also included bone broth everyday, a limited amount of fruit, and a variety of probiotic and fermented foods. Every recipe and product on this AIP meal plan is 100 % AIP compliant– no guesswork! This AIP diet meal plan uses a combination of recipes AND store-bought items. This is so you can have a plan that is both cost-effective and convenient. While you should aim to cook your meals from scratch as much as possible, there is still value to pre-packaged AIP products. They’re convenient, and easy to take on the go. I would rather you eat some store-bought foods throughout the week than fall off the wagon because you’re so stressed with cooking. All your lunches and dinners will be cooked from scratch, but occasionally a snack or breakfast item will be pre-packaged. All pre-packaged items are minimally processed, 100 % AIP compliant, and available for purchase at ShopAIP. Store-bought items are either single servings or used multiple times throughout the week so that you can get the most use out of them. You can continue using these items throughout the rest of your time on AIP, so nothing goes to waste! 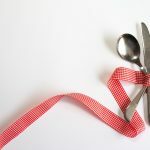 I’ve designed this AIP menu plan for ONE person, so you will be eating each recipe you cook twice throughout the week. This is so you can save money, spend less time cooking, and minimize waste. After you cook each recipe, I recommend that you eat one serving, store one serving in the fridge for later in the week, and freeze the rest! That way, you have plenty of tasty AIP meals in your freezer for the coming weeks! How’s that for convenient? If you need to feed more than just one person then serve the recipe as is and skip freezing the leftovers. Unless otherwise noted, you should eat ONE serving of a recipe for a meal. If you’re super hungry, you can eat one more serving. I basically consider this to be an AIP sample menu for a week, so that you can get an idea of what a typical week on AIP should look and feel like. It also takes the guesswork and stress out of figuring out what to eat, what not to eat, how to fit in all your servings of XYZ, etc. It’s already planned out for you! Where can I buy AIP compliant products? For your convenience, all the links to pre-packaged products in the one week AIP meal plan are from ShopAIP. This is so you can batch order everything from just one website and get free shipping. ShopAIP offers free shipping for orders over $49 and orders ship on the same day when ordered by 1 pm ET. ShopAIP is an awesome resource for anyone on the AIP diet because every single item they sell is AIP-compliant, so there’s no guesswork involved! Use the code SHOP to get 10 % off your first order at ShopAIP by clicking here! At the end of the AIP menu for the week, I’ve included a ShopAIP grocery list with all the pre-packaged products used throughout the week. This is for your convenience, so you don’t have to hunt for them in the AIP menu plan. What if I’m still hungry? You can always add more green vegetables if you’re hungry. You should be aiming to eat as many vegetables as possible each day, so feel free to add as many extra servings as you need to feel full! Add more fiber. Check out Fantastic Fiber for tips on how to add more fiber to your diet. You can double the servings of recipes (i.e. eat two servings instead of one). You can add a starchy vegetable to your meal, such as sweet potato, butternut squash, or beets. I didn’t include many starchy vegetables in the AIP diet plan because I wanted you to be able to add them based on how many carbs you need to feel full. Drink some bone broth or collegen peptides. These both contain protein and essential nutrients that will help fill you up. What if I’m too full? You do not– I repeat DO NOT have to eat every single food on this AIP meal plan. It’s more of an AIP sample menu, so you can see and experience what a typical week on AIP would feel like. If you’re full then feel free to skip the snack! The snack is totally optional. You can also cut down on portion sizes, if you find them to be too big. The one thing I would NOT cut is the amount of veggies you’re eating each day. Sarah Ballantyne recommends at least 8-12 cups of veggies a day on AIP for optimal healing. If you find that you’re too full on this plan, I would eat your veggies first before the rest of your food to make sure you get your daily servings in. Bone broth is a very healing food. It’s glycine-rich, nutrient-dense, and extremely filling! Read more about the health benefits of bone broth here. I’ve included bone broth in every single day of this AIP menu for a week. You have the choice between store-bought for convenience or homemade for cost-effectiveness. If you use store-bought, you have the option between beef or chicken single serve bone broth (sooo convenient– just add water and go!) You can also get both beef and chicken to mix it up! What if I don’t like offal? Offal is an important aspect of the AIP diet and healing. Sarah Ballantyne recommends at least 5 servings a week of organ meat and offal. The more the better! This is because organ meat is the most concentrated source of just about every nutrient, including many vitamins, minerals, healthy fats, and essential amino acids. You can read more about it here. In keeping with Dr. Sarah’s protocol, this AIP diet plan does contain 5 servings of offal and organ meat throughout the week. This is so you can optimize your healing. 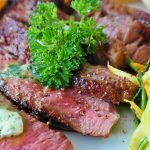 I’ve chosen the best AIP diet offal recipes and I promise they do taste very good. A lot of people think they don’t like organ meat (myself included) but once they try it, they actually enjoy it! I highly encourage you to at least TRY one of the offal recipes and keep an open-mind about liking it. That being said, if you absolutely cannot stand eating offal then you can swap out those recipes for other AIP diet recipes. I recommend replacing the offal recipes for beef, lamb, or pork instead of chicken (due to high omega 6 content). How many vegetables should I be eating on AIP? Sarah Ballantyne recommends at least 8-12 cups of veggies per day. She also recommends that you eat a variety of them. I’ve incorporated many servings of vegetables into this AIP menu plan each day, but you can always feel free to add more! Throughout this AIP meal plan, you’ll often see a recipe with “____ servings of veggies on the side”. I purposefully chose not the specify the type of vegetable, so that you can 1) eat a variety 2) eat what you have available in your house and 3) eat what’s seasonal. I’ve given you the freedom to choose many of your own vegetables sides in this AIP sample menu, so that you can create your most nutritionally dense week. You’ll notice that this AIP menu plan does not include many starchy vegetables, such as sweet potatoes, butternut squash, beets, turnips, plantains, and cassava. This is a deliberate choice. Everybody has different starch and carbohydrate needs. Starchy vegetables have a different nutritional profile than green vegetables, so I defintely recommend that you include some in your diet. Sarah Ballantyne suggests “as much variety as possible and the whole rainbow” for veggies. This is why throughout the week, you’ll often see a recipe with “___ servings of veggies on the side”. This is so that you can choose a variety of starchy and non-starchy vegetables to include in your AIP menu for the week. What’s the deal with fermented/probiotic foods? Dr. Ballantyne recommends fermented/probiotic foods on the AIP diet for optimal gut health. This includes fermented veggies, kefir, coconut milk yogurt, and kombucha. You can also try probiotic supplements (always consult a doctor first). This AIP protocol meal plan includes several servings of fermented veggies per week (sauerkraut for convenience, but feel free to mix it up), as well as coconut yogurt or kefir. You can add more if you so choose. What if I don’t like or can’t eat one of the recipes on the AIP meal plan? No problem! Just swap out the meal you don’t want for any other AIP diet recipe from the blogs listed below Day 7. You should try to keep the protein and general nutritional profile the same (i.e. if it’s a salad with salmon, try to swap out the recipe for another salad with fish). The recipes in this AIP menu plan are chosen deliberately to provide nutritional variety and follow Sarah Ballantyne’s protocol. It’s carefully designed so that you get a certain amount of veggies per day and a variety of proteins throughout the week. Just make sure you keep this in mind when you swap out recipes and you’ll be fine! Does this AIP menu plan include sweets? Sweets are controversial during the AIP elimination phase. Dr. Ballantyne’s approach does allow some sweets (derived from maple syrup, honey, dates, molasses, or unrefined cane sugar) in moderation. As a rule, you shouldn’t eat too many sweets on AIP because sugar in any form contributes to inflammation. Some people choose to cut sweets out all together during the elimination phase, while others choose to enjoy the occasional treat. This one week AIP meal plan does include a few sweets as snacks throughout the week. These are completely optional and if you’re choosing to avoid sweets, you can either skip snacks on those days entirely or swap the sweet snacks out for savory snacks, such as Zora Bars or bone broth. If you’re unsure of whether to include sweets during the elimination phase of AIP or not, use your personal judgment. Observe how your body reacts to sweets and decide from there. Remember, everyone is different and healing is very individual. Do what works best for you. Please note that if you’re following Dr. Amy Myers AIP diet, you should avoid sweets entirely during the elimination phase. How can I learn more about AIP? If you’re eager to learn more about AIP, I recommend checking out Dr. Sarah Ballantyne’s online course, The AutoImmune Protocol Lecture Series. This is a comprehensive course that will teach you everything you need to know to rock AIP! The course doesn’t start until September 9th 2019, but I recommend joining the waitlist here to be notified when enrollment opens on July 1st. 3 Genius Ways to Make Any AIP Meal Taste Delicious! FREE One Week AIP Meal Plan– Heal Autoimmune Disease Naturally! The recipe links in this AIP meal plan were from the following blogs. Check them out for more AIP recipes and tips! Did you try this AIP menu plan for a week? What did you think? Comment below and share your experience with us!